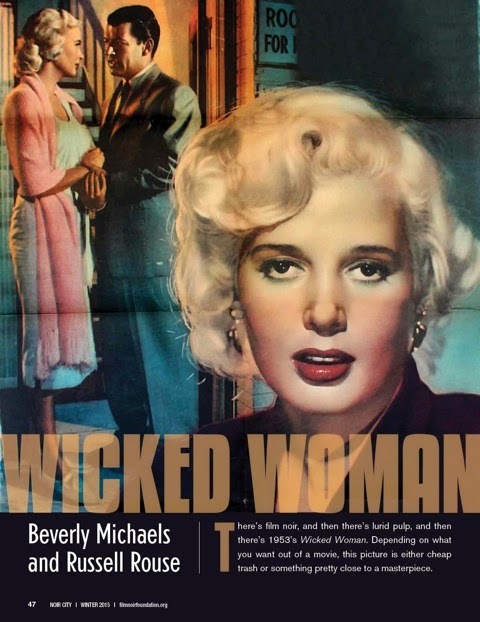 My piece on actor Beverly Michaels, her husband director Russell Rouse, and the making of their classic film noir WICKED WOMAN appears in the new issue of NOIR CITY. Check it out. JH: What was she like? I only know her as the brassy dames from her noirs. What was she like in real life? What did she like to do, to talk about? What did she care about? CR: Mom was a very complex and highly intelligent woman. She was the product of her upbringing--a girl who grew up quickly on the streets of New York--becoming a model, a showgirl, and an actress at early ages. Not a typical path for a girl, and not an easy one. And so she was tough and brassy in real life as well, but Mom also had a huge heart, and would do anything for the people who mattered to her. Mom loved films, plays--all the arts. She loved to read, both fiction and non-fiction. As I said, she wrote plays but stopped after while. She was highly political--a very liberal Democrat--and was involved in several political causes and with several groups throughout her life (for example “Another Mother For Peace”). JH: The big question that all Beverly Michaels fans would want me to ask is why she retired from films. You said she was a bit of a cipher about her career, so what I would be really fascinated to know is how she felt about it overall. How do you think she saw it? I know that some of the actors who eventually became noir icons still always regarded their careers as failures. Which is to say that they got into movies hoping to be a big star like Bette Davis or Ingrid Bergman, and since that never happened they regarded their career (even if they eventually became a cult figure) as having failed. Would that describe your mom, or do you think she saw it another way? Did she appreciate that she had become something of a cult icon among noir geeks? CR: The short answer is that Mom retired because she wanted to start a family, and she couldn’t reconcile having a career and giving her kids everything from her she thought they’d need. As years passed I think she began to feel the loss of her career more profoundly… It’s very difficult to give up such a large part of your identity, no matter how noble the cause for which it has been abandoned. Though she never gave voice to it, I imagine she wished she had become a “bigger” star. And I do think she felt somewhat underappreciated in her day… That for the most part her roles were seen as less significant “B film” endeavors, rather than as dynamic parts which portrayed complex, empowered women. Years later when she began to realize she was a bit of a cult icon, it pulled her in two directions. She was truly flattered by the attention she received, but because she’d become increasingly private as she got older, she never really embraced it fully. For more of my interview with Chris Rouse, check out the article in NOIR CITY e-mag, available now.